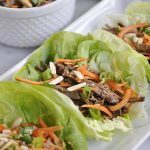 Beef Lettuce Wraps are a great option when you are trying to cut down on carbs or are eating gluten free. 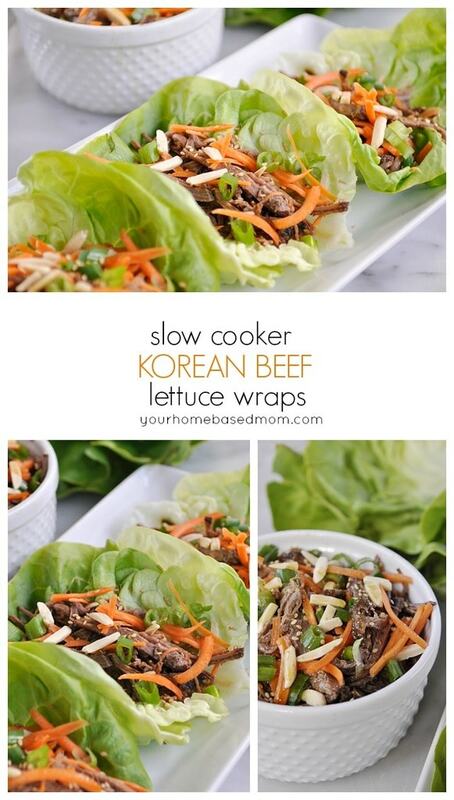 These Korean beef lettuce wraps are so delicious and easy to make in your slow cooker! 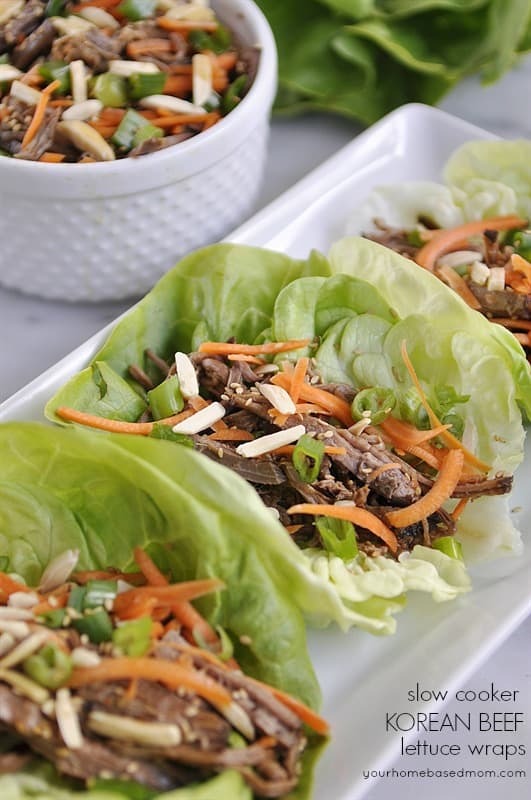 If you are looking for something healthy, yummy, and fun to eat, than these Slow Cooker Korean Beef Lettuce Wraps are the answer to your quest. 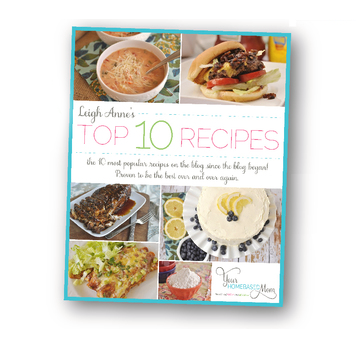 My husband is gluten free so a lettuce wrap is a great alternative to a sandwich. 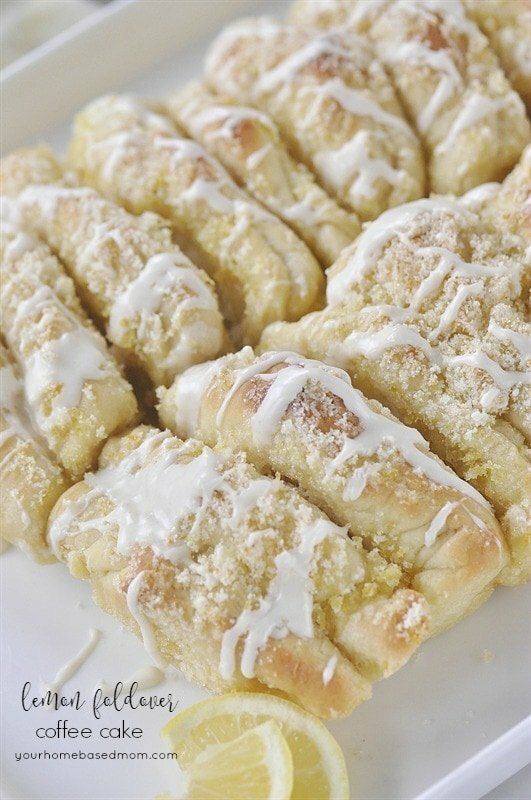 And if you are counting your carbs they are a great choice. 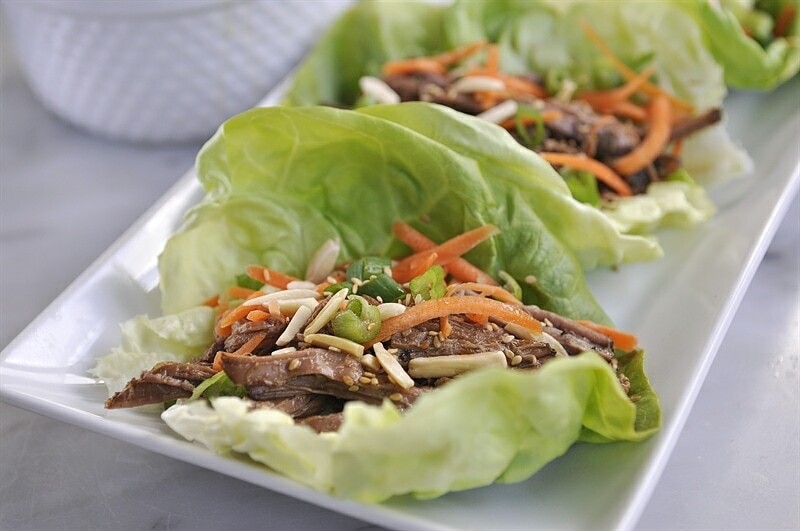 These beef lettuce wraps are made using beef bottom round roast. You get a lot of great flavor from soy sauce, rice wine vinegar, ginger, sesame oil and a bit of sweetness from some brown sugar. 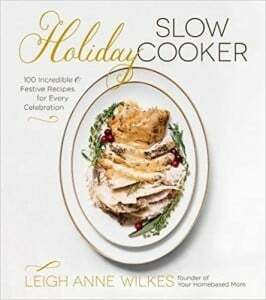 Everything cooks for about 8 hours on low in the slow cooker. And when it is done, it is nice and tender. All you have to do is pull it out and shred it. Reserve some of the sauce to use over the meat and to help keep it moist. This Korean Beef could totally be served over rice, but it is fun to change it up now and then. And a lettuce wrap is just a fun way to eat. 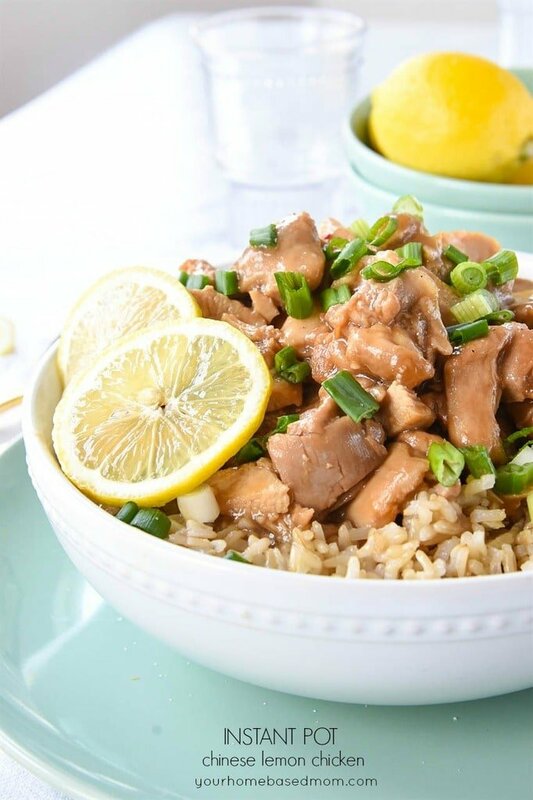 I sprinkled the meat with some shredded carrot, chopped green onion, a sprinkle of sesame seeds and a dose of slivered almonds which gives it lots of great texture and crunch. I served it on butter lettuce which I think is easier to eat than Iceberg which is crisper and tends to fall apart easier than the softer butter lettuce. 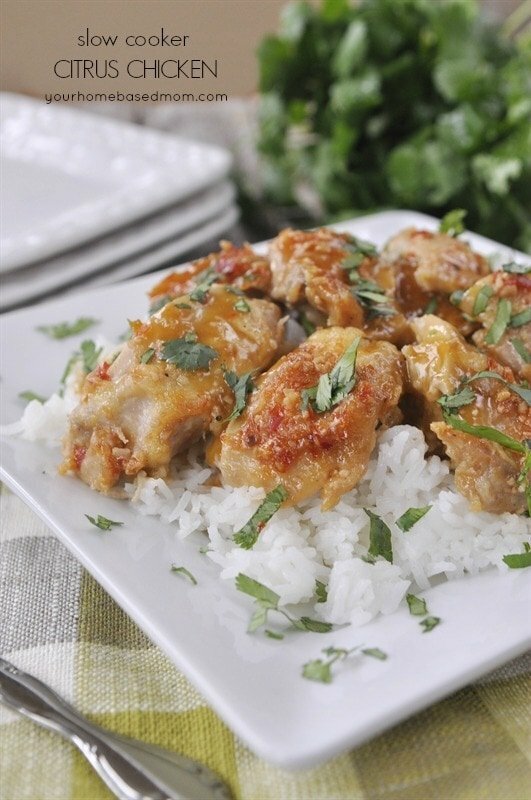 Enjoy this yummy and healthy dinner idea this week! 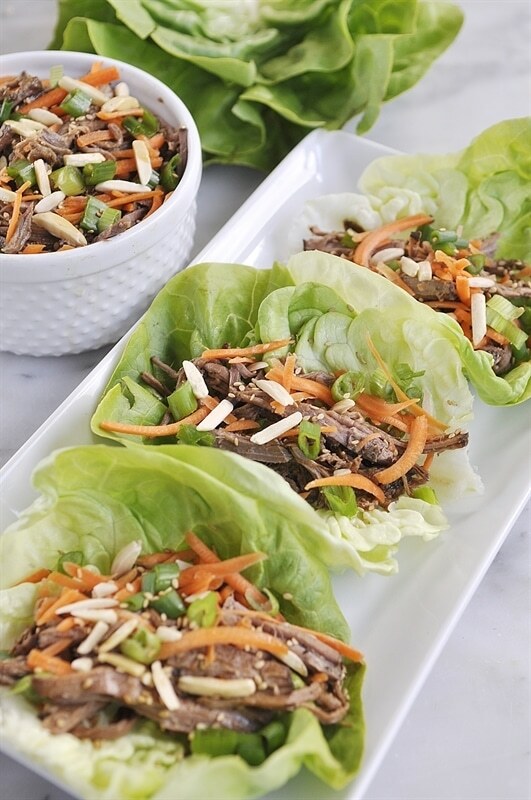 These delicious beef lettuce wraps are made with your slow cooker! Combine onion, garlic, soy sauce, vinegar, sesame oil, brown sugar and ginger. Strain remaining liquid and reserve some to add to meat to moisten it. 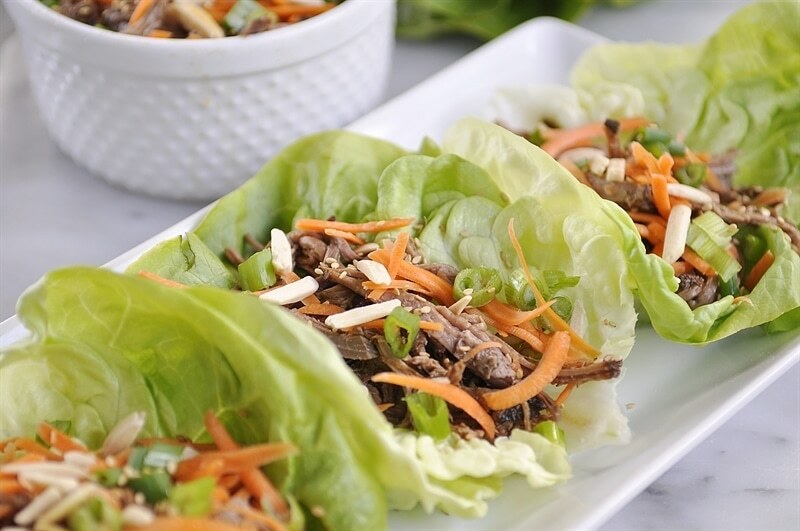 Serve on lettuce leaves topped with shredded carrot, toasted sesame seeds, diced green onion and slivered almonds.